If you are a Christian artist, I hope that this personal experience will encourage you to persevere with your talents no matter what. When I was a baby in Christ (summer of 1997) I took an advanced drawing class up at school (Drawing III). 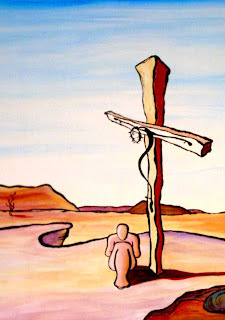 At the time, I was so new to Christianity and every aspect of my life (thinking, believing and behavior) was changing at almost break-neck speed...as a result, all of these changes were starting to show up in my artwork. The Drawing III studio class was a 6 hour Saturday class that I took in addition to a full school schedule and working full time. Due to time constraints, I was only able to work on my artwork during the weekly 6 hour studio class time, which proved a lot to me as time went by. At the onset of the semester, my instructor, Yvonne, separated me from the rest of the class and I worked in an empty studio across the hall from everybody else. After 3 weeks, she started the habit/routine of coming in to look at my work in the morning and berate me: "that is immature work" or "that looks like something a high school student would do" or "I can't stand those colors, they're not working" or "you need to change this, it looks horrible" etc. At the end of the class period, she would come back into the little studio and say that she liked what I was doing, everything looks great, etc., great progress. Things started to get very confusing for me, because after I packed away my supplies after class each Saturday, I would not work on the artwork until the next class time. (My schedule was FULL and there was no time to work on art outside of the class.) Yvonne would approve and praise a drawing at the end of class one day and then be totally disgusted with it the next week, when nothing had changed since the last time she had seen it. (????) After 2 months of this going on every Saturday, it started to wear me down. I did not recognize what was going on...spiritually speaking. Since I was feeling so confused, I decided to connect with one of my previous professors, Dr. Donna Adams, and get her opinion of my new body of work. I told her that for the first time I felt focused in my work and that it was the best I had ever done, but I was getting a lot of push back from Yvonne and needed another opinion. I was actually feeling so torn that I was contemplating just giving up art altogether. I met with my old instructor on a Sunday afternoon and was very nervous... Maybe the work was crappy? Am I wasting my time? Donna arrived at the school and I started showing her the new artworks. Her mouth kinda gaped open and I thought to myself, yep, it's crappy....... Well, that wasn't what she was thinking...and what she said to me has been permanently etched into my mind: "You have a beautiful visual voice and I've been waiting a long time for you to have something important to say with it and now you do. Never stop expressing these kinds of things. Right now, as a student, your job is to learn and keep your GPA up, so I would advise you to do whatever it takes to get your A in Yvonne's class, but keep on working on these types of themes outside of class. Get your grade, but follow this passion and continue to express it. Every musician has a listener, every writer has reader, and every artist has a viewer. You've just got to find your audience and speak directly to them." A life changing moment for me. After our meeting I decided to act on Donna's counsel and the next weekend, I skipped the Saturday class so that I could stay at home and create another body of work to appease Yvonne. I spent a little over $250.00 and created 10 new paintings in 2 days. I absolutely hated the paintings, but I was trying to do what Yvonne wanted me to do. The next Saturday, I took all of the paintings up to school and set them up in my studio space and told Yvonne that I had created 10 new paintings based off her previous direction and wanted her to come and see them and critique them. She told me that she would right after she got the rest of the class started on their project. I went back to the studio across the hall and waited for an hour, but she didn't come over. I decided to go back to the classroom and she said that she would be right over. I waited another hour, but she still didn't show. I went back to the classroom and she said that she would come over at the lunch hour. So...I went back to the studio and waited. I was very nervous... Would she like it? Would I get an A for the semester? Another hour passed and I decided to go back over to the classroom to see if she was even there. As I was walking towards the classroom, she met me in the hall and had a melt down... She got a very nasty tone with me and said "I don't need to see the paintings. I know they aren't any good. I've decided to give you a C for the semester. Religion doesn't belong in art, nobody wants to see God in art, it doesn't sell, galleries won't show Christian art, nobody cares about God being represented through art." WOW!!!! The truth Finally came out! Now all of the tension and rudeness was explained. It wasn't me or the artwork that she didn't like...it was the religious theme. It took her 3 months to boil over and when she did, I assure you it wasn't pretty. What I think was so crazy was that we still had 3 six hour classes left in the semester and she had already determined my final grade before reviewing the entire body of work for the semester. I didn't return to her class after that day, but I did get my C. I was more proud of that C than all of the A's I have received in my art studies over the years combined, because of the spiritual principles that were taught to me during the course of that semester. What a blessing in preparation. Dear Christian Artist, as you continue to express your faith through art, some people you know and love may try to discourage you with negative remarks. Some people that you respect in the art field may try to deter you. IF you feel that God has put it upon your heart to visually communicate the things of His nature, please do it. Follow Him in that leading. IF and when opposition/persecution comes, stand strong in your faith, pray for guidance and for the truth of the situation to be revealed so that you can learn from it. You have a very beautiful visual voice and now you have something very important to say with it. Speak loudly. Firstly, I would like to say Thank You for your great choice of scriptural "sips" over at Rays blog. They always make my day. Keep them coming. I recently wandered over to flinging dust's blog and saw the crude words she had with you. It makes me so sad that she thinks and believes that way. Anywho, I thought you might like this scripture: It's from John, Chapter 15, verse(s) 18-27! Keep on fighting for the Lord sister! p.s. I absolutely Love your art. Especially the "Angel" and I think it was "Genesis #10", very beautiful and so peaceful. I hope to buy a couple of them in the future! I do hope that you get back into painting when your schedule permits. I thought about doing graphic design a while back and took a few courses, but doing art on a computer was really difficult...I love getting paint all over my clothes and hands, so I found out that wasn't the path for me. That was quite a story you've posted about finding your visual voice and the opposition that you faced! I too am a Christian artist and have encountered similar objections simply because of content, as opposed to technique,composition,design, or any number of the other factors that make up a compelling work of art. I invite you to post some images of your work there along with your story and link back to your site here. I truly believe that other artists will benefit from hearing your story. May God continue to bless the work of your hands.